Have you seen that commercial that substitutes a port-a-potty for your bathroom? I laugh whenever I see it. Mostly because I feel like it represents how my bathrooms smell. Gross right? But with a house full of men/boys (including the pets! ), the struggle is real. I mean seriously guys. Do you wait too long to go? Do you shoot from the door? Or are your eyes closed when you’re going pee? I don’t want to know! But those are the only explanations I can come up with for having to deal with urine splash, everywhere. And I mean including the walls! My regular bathroom cleaning routine includes wiping down the whole toilet and scrubbing the bowl. 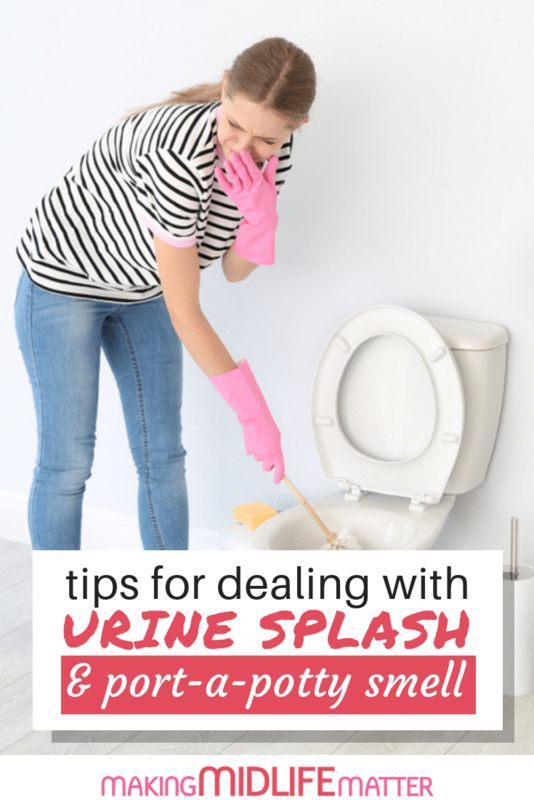 But at least once a month, I have to do a deep, thorough clean to get rid of the buildup that causes that awful urine odour. Get ready. You’re going to need some plastic gloves and quite possibly a mask for this job so you don’t gag from getting down and nose level with the porcelain throne. Let the cleaning products do all the work. If you like to use a store bought toilet bowl cleaner, squirt a generous amount under the lip and let it run down the inside of the bowl. Then use your toilet brush to spread the product throughout the bowl. Don’t over scrub. Let it sit till you have completed the rest of the toilet cleaning. If you wish to use more natural products, throw in a DIY made toilet bomb and let it do it’s magic. 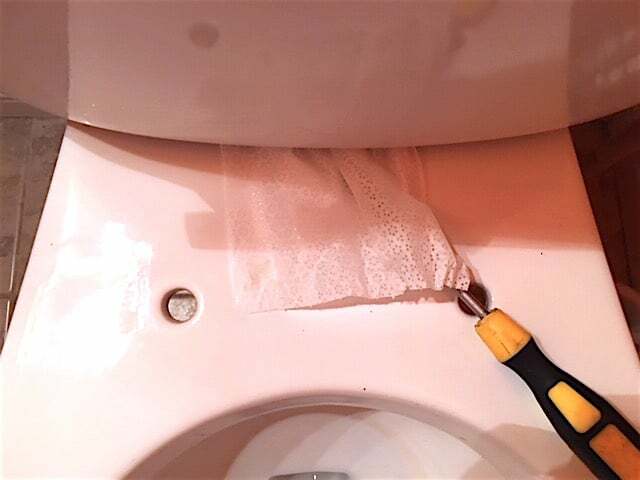 Remove the clips that hold the toilet seat in place. Using a screwdriver, carefully lift the tabs on the clips to reveal the plastic screws. Rotate the screws counterclockwise using the screwdriver whilst using the other hand to keep the screws from rotating underneath. I’m going to warn you, it’s probably wet and sticky on the underside. Separate the screws/clips from the toilet seat. 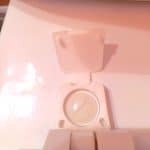 Remove the plastic, egg-shaped bolt covers from the bottom of the toilet. (They cover the bolts that secure the toilet to the floor). Place the screws, the bolt covers and any other small pieces in a small container. Pour in cleaning vinegar until items are completely submerged. Add one tablespoon of baking soda. Let sit. Clean the toilet seat with your favourite cleaner in the laundry sink. For the lovely scent, I like to use Mrs. Meyer’s Clean Day Tub & Tile Lavender Cleaner Spray. Use a pipe cleaner, toothbrush or a wet wipe wrapped around a screwdriver to clean the round holes around the clips. Dry using paper towels/old rag or microfibre cloth and set aside. 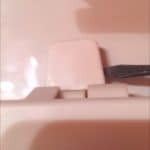 Use a screwdriver or putty knife with a wet wipe to get in between the bowl and the tank. 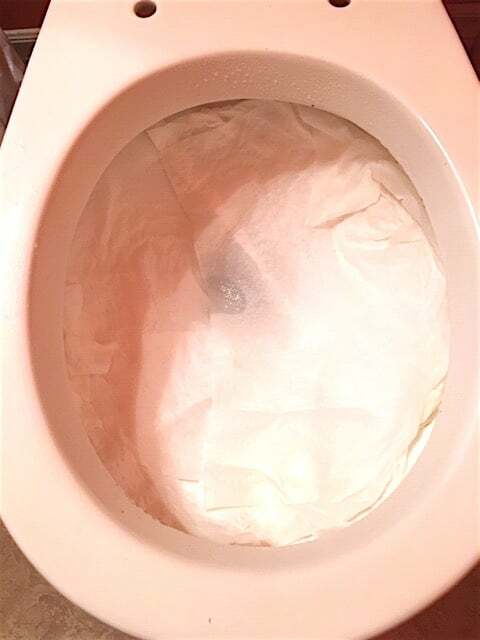 Be careful not to use too much force and make sure your tool is always covered by your wet wipe so you don’t scratch your toilet. Starting from the top, working all the way down to the floor, spray your whole toilet down with your favourite cleaning solution and wipe down. Make sure to get in every crevice and underneath the holes the screws were in. Spray the area between the toilet and the floor and wipe. Holding a wet wipe, clean the supply water line from tank to floor, including the shut off valve. If your toilet is close to a wall, you will have to wash that too. Be careful to test a small, inconspicuous area with any product you are going to use on your painted walls for discolouration before you go spraying the whole area. The best solutions are the homemade ones without harsh chemicals. The product in the bowl should have done most of the work for you by now. Scrub the inside of the bowl well. Flush. If your bowl is extremely discoloured, you may need this extra step. Turn off water supply to toilet. Flush so that the toilet bowl is empty. Using toilet paper or paper towels, line the inside of the bowl. Spray household cleaning vinegar to hold in place. You may have to leave overnight depending on how stubborn the stains are. Be sure to remove the toilet paper or paper towels and throw them in the garbage. Do not flush! You could clog your toilet. Don’t forget to turn the water supply back on. Check on your screws and bolt covers. Are they clean? 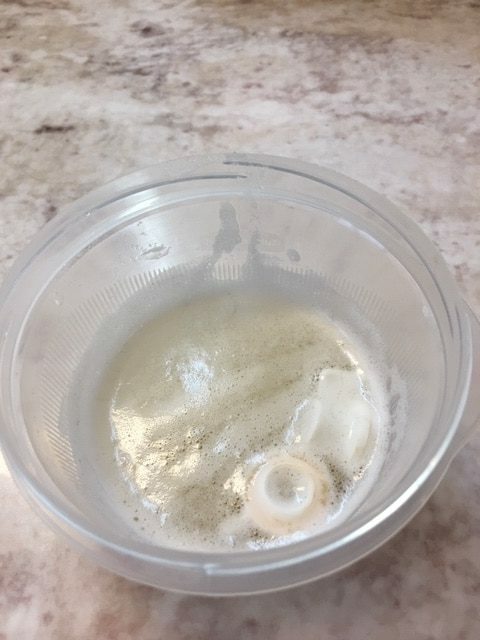 You may need to use an old toothbrush to scrub away any residue the vinegar and baking soda solution wasn’t able to get rid of. Rinse and dry. 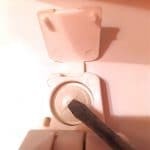 Re-attach the toilet seat and bolt covers. Keep you bathroom smelling nice in between deep cleans with an Air Wick Scented Oil in Lavender plug in deodorizer. Perfect for your powder room. I don’t want guests to smell a port-a-potty! Keep the Air Wick at its lowest setting as the fragrance can get quite strong in a small bathroom.